No fewer than 2, 000 members of the Indigenous People of Biafra (IPOB), on Monday, took to the streets and roads of Onitsha, Anambra State, on a peaceful march to sensitize the general public on the sit-at-home order it declared on May 30 to honor the fallen heroes of the Biafrans. 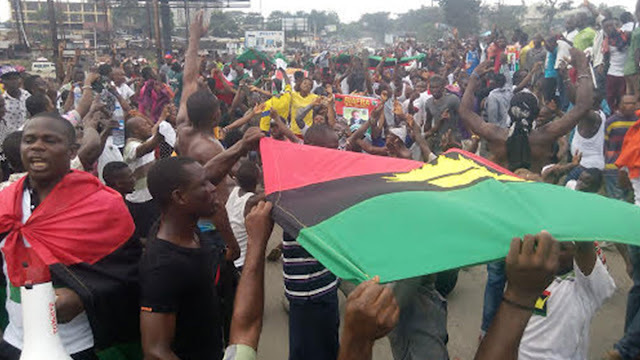 The group, comprising Lion Squad, a security outfit of the organisation and other members with Biafran flags, chanted freedom and solidarity songs such as “IPOB purported proscription arrant nonsense” “Nigerian Federal Government has no power to brand IPOB terrorist group” “Biafrans, Igbo we must be proud of our own” “IPOB and genuine Biafra agitating group cannot be intimidated out with Army and Police”. They marched through Awka road, Old Market Road, Main Market, Sokoto road, Haruna Street, Williams Street to Creek road and Ziks Avenue, Port Harcourt road all in Fegge to Upper Iweka and terminated at Owerri road, insisted that the people should remain indoors on Wednesday or stand to be blamed in case of any eventualities. The group were distributing handbills and flyers with inscription “May 30th, 2018 is Biafra Day, celebrating 51 Biafra anniversary, we remember the fallen heroes of 1967-70 including the victims of Asaba massacre, all slain freedom fighter of Biafra IPOB, MASSOB and all victims of Fulani herdsmen and all other state-sponsored killings in Nigeria”. They were in an orderly manner marched around the commercial city which caused gridlocks within the period it lasted but did not accompanied with any security operative or being disturbed by any person or group of persons but were busy sharing their handbills, telling the members of the public to sit at home on Wednesday to honour those who died during the civil war and those who died during the cause of the struggle of Biafra state. Some of flyers and handbills they were distributing carried the pictures of fallen heroes such former Biafra leader Dim Chukwuemeka Odumegwu Ojukwu, Col. Joe Achuzia, Major-General Philip Effiong, Timothy Onwuatuegwu among others as well as corpses of those who died during some of their rallies and protests. Though, they did not stop anywhere to talk to anybody but one of them who did not mention his name was shouting, no market, no movement, no school, no business, no church, no vehicle should be opened on Wednesday as directed by its leadership as an annual ritual to honour those who fought and died for the Biafra and those who died in the struggle”. The group had declared a suit-at-home order on May 30th being Wednesday to honor the fallen heroes of Biafra.